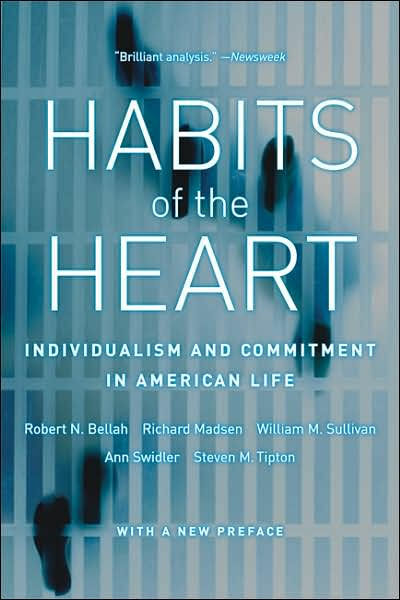 More than twenty years ago, Robert Bellah described how Americans were adopting Habits of the Heart (the title of his 1985 book) that lead us to live in “lifestyle enclaves” of people who share our values. Once most Americans lived in families, in communities, in churches not of their own choosing. Relating to your neighbors, whether you liked them or not, was a given. Identity and community formed in relationships that were given by circumstance. Over time, industrialization and urbanization, military service, and increased mobility all loosened the ties to land and local community. Increasingly people chose who they related to. Increasingly we have chosen to relate to people like ourselves. In our chosen “lifestyle enclaves,” we no longer mix it up with people who are different from ourselves. Rather, we limit our social relations to people who reinforce our preferences. Pretty soon we don’t even see or take account of people who aren’t like us. In 1985, Bellah couldn’t have anticipated the ways social media now makes relationships even more voluntary. Today, if you aren’t interested in the dinner conversation, you can take out your smart phone and join another conversation altogether, among people who may never sit at the same table. Bellah and his associates noted that kinship, religious communities, civic traditions and friendship, are institutions that have held people in relationships not of their choosing. But today, all of these institutions are strained and adapting to quickly changing norms and many of the relationships that rely upon them have come significantly unstitched or changed radically. Jesus Christ built community among people who were deeply divided from one another: Jews and Gentiles. Slaves and free. Women and men. He invited his followers to gather all kinds of people together, and help them grow to know and love one another. Jesus is calling us out of our lifestyle enclaves into human community, as surely as he called Lazarus out of the tomb. How can the church become public again – involved in the public square; a place to talk with one another about what we really care about, what keeps us awake at night, and makes us worried for our children? A place where we turn together to the great mystery of life and love, to give thanks and to ask for mercy, forgiveness, and direction. There is no better gift for our day than to tear down the dividing walls and invite unlikely conversations among people who think they have nothing in common. May the prince of peace open a way of healing before us. It is rare in my experience to hear from a Bishop in times of grief, angst and fear. Thank you for your thoughtful letter.